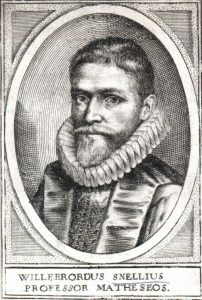 During the Golden Age, Willebrord Snel van Royen was an eminent mathematician, physicist and astronomer. Wiillebrord is better known with his Latin name ‘Snellius’. 50 years before Antonie van Leeuwenhoek and Christiaan Huygens started practicing science, Snellius was already full up to speed. His expertise was in the geodesy, navigation, hydrography and astronomy. Anyone that paid even a little attention in high school knows Snellius from Snell’s law; the law of refraction of light at the transition between two different substances. However, Snellius received his fame mainly because he was the first scientist that calculated the circumference of the earth. He did this by measuring the exact distance between Alkmaar and Bergen op Zoom by using triangulation, or trigonometry. In fact Snellius was the first geodesist. During the turbulent years of the second world war, some geodesy students in Delft took the initiative to establish the geodetic society ‘Snellius’ in 1940 as an alternative for Practische Studie (the study association for Civil Engineering students). However, because of the war, the young student association had to start over again after the war had ended. In the upcoming years, both Snellius and the number of students of the geodesy faculty grew. Snellius got his own bar, a summer camp and the faculty had its own building. Unfortunately, around the year 2000 the faculty has some lesser years; a low number of students register for the study and in 2003 the TU decides to close the faculty. The study continues as the master Geomatics and moves to Aerospace Engineering. This led to the end of the geodetic society Snellius. When the department moves to Civil Engineering and Geosciences in 2012, a new master is founded: Geoscience and Remote Sensing. Where Geodesy is mainly focused on positioning, this master covers a broader range by adding topics like atmosphere and oceanography. Next to master students, there are a lot of PhD students attached to the department. That is why Snellius is re-established as a dispute. With this dispute we hope to add something to the master track, both on educationally as socially.